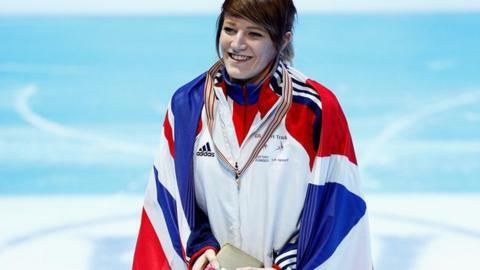 Great Britain speed skater Elise Christie hopes to use January's European Championships in Sochi to hone her challenge for a world title. But the 25-year-old believes an ankle injury has hit her chances of winning a world title in Seoul in March. "I'm working on things that are going to make a big difference at the World Championships," said Christie. "But the injury has taken me back. I'd have serious disbelief if [I won the world title] now." Christie was crowned overall European Short Track Speed Skating Champion in Dordrecht last year and is favourite to win honours this time round from 22-24 January in Sochi - where she suffered Winter Olympics disappointment in 2014. However, with the World Championships in Seoul coming less than two months later she is hoping to peak for that competition instead. "Obviously I want to retain at least one if not all of my [European] titles but the tactics at the Europeans won't necessarily bring success at Worlds," she said. "I've never really gone in as a favourite for anything. It's making me feel really confident that everyone believes in me. "But the peak for this year are the Worlds, so I maybe have to take a step back from what I'm good at in Sochi and do the things that are going to make me do well at the World Championships." Christie is playing down her chances of attaining her goal of world success after she damaged ankle ligaments and tendons in training last summer. Despite that, she has still managed to win three World Cup medals this season as well as post a personal best time in training. "Before the injury I was saying I wanted to be world champion and I believed I could," she said. "But it's been almost like starting my season again. "The first week back on the ice I thought there's no way I'll even be able to win medals again. "I still have pain now but it's a lot better than it was and once I've finished the season I can rehab it properly and next year it won't be a problem."